"... fought in western South America, between Chile and allied Bolivia and Peru in a variety of terrain, including the Pacific Ocean, Atacama Desert and Peru's deserts and mountainous regions in the Andes... Chile acquired the Peruvian territory of Tarapacá, the disputed Bolivian department of Litoral (cutting Bolivia off from the sea), as well as temporary control over the Peruvian provinces of Tacna and Arica." Modern-day Bolivians still want to reclaim that land. For more than a century, Bolivia has done a lot of magical thinking to support its claim that this condition is only temporary. The country has a star for El Litoral (The Shore) on its coat of arms, and it hosts a yearly pageant to choose a beauty queen for the former territory. Chile, for its part, hasn’t budged. Indeed, Bolivia is still trying to negotiate a corridor. Sounds like a sensible proposal. Too bad the Peruvian guy nixed it. Chileans have always been yanking Bolivia's chain on this issue when it suits them, that's why the Hague litigation, because talks to resolve it, go nowhere. if putin was bolivian, this would have been settled long ago. They will never have it back. I learned about this war the hard way. I was visiting Peru in the fall of 2000 with a group of nine, and were in the city of Puno, on the coast of Lake Titicaca. We had a dedicated driver and a guide in a large van. We were scheduled to stay overnight at the lesser-visited island of Amantani, staying with a family and not in a hotel or hostel. When we arrived at the port at 8:00 a.m. to go to our boat and disembark, we were instead told that all normal port activity was postponed while the Peruvian military conducted ceremonies honoring the War of the Pacific. The ceremonies lasted all morning. We finally got a boat out at 1:00 p.m. But that was too late in the day to go to Amantani. The problem was not that Amantani was closed or that the trip was that long. It was that in early October the storms come up on the lake. Our boat pilot did not mention any of this, and we got caught out on the lake when a squall line came through. Our boat was only about 25 feet long and was underpowered and without a radio. The waves eventually reached 8 feet high (my estimate), and the boat was keeling over about 30-35 degrees each way. I honestly did not think we would make it to land safely. And the water temps were about 40°F, so had we capsized, we were unlikely to be able to swim to shore before suffering from the cold. 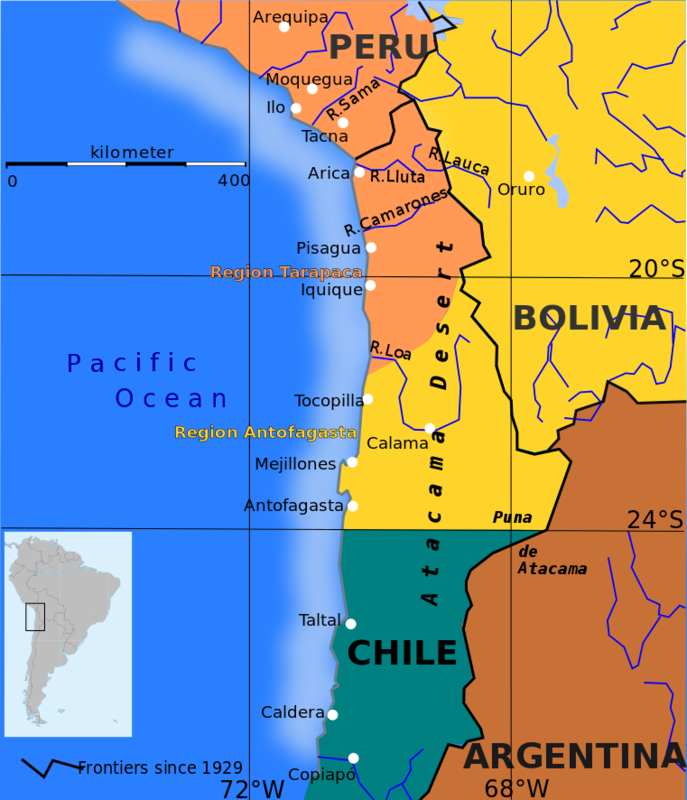 Bolivia lost its coastal territory, but for the most part it is the worst place in the world - the Atacama Desert - so they didn't lose that much. At the time we visited, Peru had opened up a new highway from Deseguadero, on the Bolivian border, to the coast, over the Altiplano. We actually took that road to the coast ourselves - a very long and boring 17-hour drive to Arequipa. The road was built in large part to give the Bolivians access to the seaports within far southern Peru. We topped out at about 15,500 feet elevation, the highest I've ever been outside of an airliner. We saw 3 small villages the entire day and almost all traffic was trucks, though only perhaps 100 all day. But the road was band-new and very good - the only road in Peru that I saw that I could say that about. So, at present Bolivia does have some sort of access to the sea. One of the dumber wars of all time. But at the same time it was all about a government in Chile fighting on behalf of private mining interests. Kind of like the U.S. government invading Iraq on behalf of the U.S. oil interests. p.s. At Deseguadero, we were supposed to cross into Bolivia and visit the ruins of Tiahuanaco and Pumu punku. But we got caught in the run-up to ANOTHER war of sorts - the Water War - and it was unsafe for Americans to travel into Bolivia for a while. It was my one chance to see those ruins - a lifetime dream - and I doubt I will ever get back down there.